Fairway is a Group Purchasing Organization (GPO) with more than $45 billion in total membership purchasing volume. Due to our partnership with Innovatix/Essensa- one of the largest GPO’s in the country, we are able to provide our members significant savings with many of the vendors they already use- companies like Staples, FedEx, Grainger, HD Supply & US Foods just to name a few. Our purchasing power allows us to negotiate pricing contracts with thousands of vendors that you use daily to buy products and services for your business. While many businesses have a purchasing staff, in most cases they simply aren’t able to negotiate the pricing that Fairway has in place simply because of our volume that we leverage. The beauty of Fairway is that we don’t replace or change any aspect of your purchasing, vendors or products- we simply help you lower your costs on your current products from your current vendors. Our business utilizes the principle of economies of scale. With $45 billion in purchasing power we are able to access price points with vendors that would otherwise be unavailable. We serve multiple industries including healthcare, hospitality, property management, education, recreation and non-profit organizations. Our goal is to provide each of our members with savings on items they currently purchase, to provide solutions and options for their purchasing needs and to provide all of our members with a high-level of customer service. 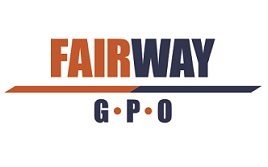 Unlike other GPO’s, there are no fees to join Fairway, no minimums to meet, no annual membership fees and no risks. We allow our members to choose from thousands of vendors and only utilize the vendors and price contracts that work for them. Even if your company has negotiated pricing with many of your top vendors Fairway can help you lower your costs with other vendors you never thought were possible. For more information on how Fairway can help you save, please call our membership team at (201) 530-5500 ext. 201 and we will be happy to assist you. We look forward to hearing from you and to partnering with you. Is there any cost to join Fairway or are there any annual fees? Membership is 100% free and there are no fees of any kind associated with being a member of our GPO. Are there minimum purchasing levels needed to join Fairway or to access your price contracts with vendors? No, there are no minimums at all. You can spend as little as $1 or as much as you like using our contracts. Do we need to use specific vendors to buy certain products or are we locked in to any vendors for any specific products or services? Just as you purchase your products and services for your business now, you can purchase any product you like from any vendor you like as a member of Fairway. As a member of Fairway, do we now place our orders from vendors through Fairway or do we have to change the way we purchase? The only thing that will change is the prices you pay for the products and services you purchase. You continue to use your vendors the same way you do now. For example, if you use Staples Advantage to purchase your office supplies online, you would continue to do so- the only change would be that the price you see online will be less than it was. If we don’t pay any fees to join and there are no costs associated with being a member of Fairway, how do you make your money? As listed in our membership agreement, Fairway receives administrative fees of up to 3% from our vendors. These fees are not charged to our members: i.e..- they are not added onto invoices by vendors. Once we join Fairway are we members for life or can we choose to opt-out at any time? Your membership with Fairway could be for life if you so choose. You are always free to opt-out at any time. This sounds to good to be true- is this really that simple? Yes- this really is that simple. The example we point to is as follows- if you were to call a hotel and look to book one room for one night you might get charged $200.00 for the room. If you got together 50 friends and called the hotel to book 50 rooms for one night, the hotel could give you a group rate that was 20-30% less than the original $200.00 rate quoted. You would still sleep in the same room and the only thing that would be different would be the rate you paid to sleep there. At Fairway, we believe there is strength in numbers and SAVINGS in numbers.